GIGA GRANADA HILLS: Hows It Going To End? 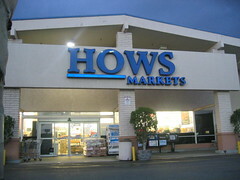 Hows Market is still open and will remain so for the foreseeable future, but the chain, which includes a Granada Hills location, has been put up for sale. "We're getting by with less help," said Eric Oerum, manager of the Granada Hills Hows, which has had to let some employees go. Otherwise, it will be business as usual at the store. "Hopefully, we'll be able to keep the stores open," said an employee at the corporate office, who declined to give his name, and said he could not provide any information about any prospective buyer at this time. Horrible, awful, terrible news. I do not want to hear that right now. I hope the chain sells. But the Hughes and Oerum family have been awfully good to this community over the years. It's a good local market! Maybe neighbors can think of additional products or revenue sources that it would be helpful to have so nearby? Has the 'tri-tip' angle been profitable? I'll bet there's people right in this area who'd love the chance to make a few extra bucks, keep the market... and build the neighborhood. Unfortunately, Linda and I have been expecting such an announcement. The decrease in staff and familiar faces has been obvious at How's for some time now. All the added competition from the expanded Target, the expanding Walmart, the upcoming Sprouts and others, coupled with the continued bad economy, has surely taken a toll.